The other day I was tasting some wines with a couple of friends, and one of them pulled out a Tupperware container filled with a dinner that his wife packed for him (aw, how cute). He heated it up and started eating away, and it smelled absolutely delicious. So of course I asked the obvious question, “Hey man, whatcha got there?” Turns out it was a sausage and pepper dish mixed with orzo that his wife regularly makes. He was nice enough to give us a taste and it was fantastic. The sausage was tender, the peppers still had some crunch, it was seasoned perfectly… but the thing that struck me the most was that I had forgotten how much I love orzo! I knew right then and there what I was making for dinner that night. Thanks Cheryl S. for the inspiration, and if all of your food tastes that good your husband is one lucky guy! So here is my take on Cheryl’s sausage and peppers, but of course I changed things around a bit to make it a little different. Bring a pot of salted water to boil, but do not drop in your orzo until I say! Ok, so this one is nice and simple. In a sauté pan heat the olive oil on high, once hot add the chorizo. When the meat starts to brown add the onion and garlic and reduce the heat to medium, sauté for 2 minutes. Add the diced bell peppers and jalapeno, a half teaspoon each of salt, black pepper, garlic powder and paprika, and the chicken stock. Stir together well, reduce the heat to medium low, and simmer for ten minutes. Drop the orzo in the boiling water once you begin to simmer the chorizo and veg, cook for one minute less than the package calls for. Once cooked drain the orzo and add it to the simmering sauté pan along with the remainder of the seasoning, as well as the tomatoes, chopped parsley and cilantro. Stir together well, increase the meat to medium-high, and cook for an additional 3 minutes. Just before plating stir in the grated parmesan cheese… And that’s it, you’re all set. Wasn’t that easy!? Click here for more information on Limerick Lane. Click here for more information on Shebang!, and here for an article that discusses Bedrock Wine Company. So there you have it, my play on sausage and peppers and the wines I recommend with the dish. I hope you’ve enjoyed the read, and I hope you’ll try the recipe and the wines. Thanks again to Cheryl S. for the unknowing inspiration… lol. As always, more content is en route. In the meantime, crack open a bottle of something awesome, sit back, and relax. Life is short, enjoy it! 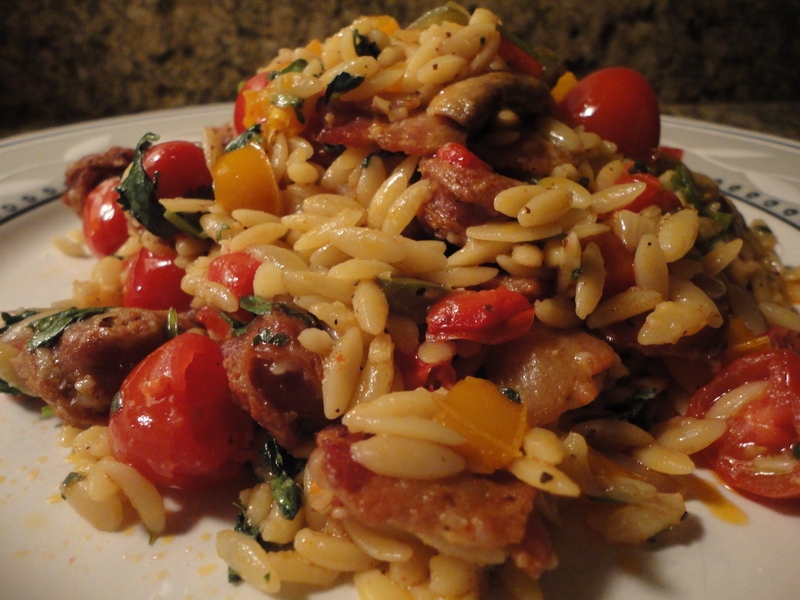 Tags: bacon, orzo, perfect pairings, perfect pairings at home, sausage and peppers, wine, wine pairings. Bookmark the permalink. Previous post ← Elvis Bread… banana, peanut butter & bacon! This was great…made it tonight only wish we made enough for leftovers! Awesome man, thanks for sharing!